Nia Coffey handles the ball. The senior forward tallied 28 points and 17 rebounds against in the Wildcats’ loss to the Nittany Lions on Sunday. Senior forward Nia Coffey’s prolific outing against Penn State was enough to make her stand out Sunday, but not enough to keep the Wildcats afloat in their 74-58 loss at home. 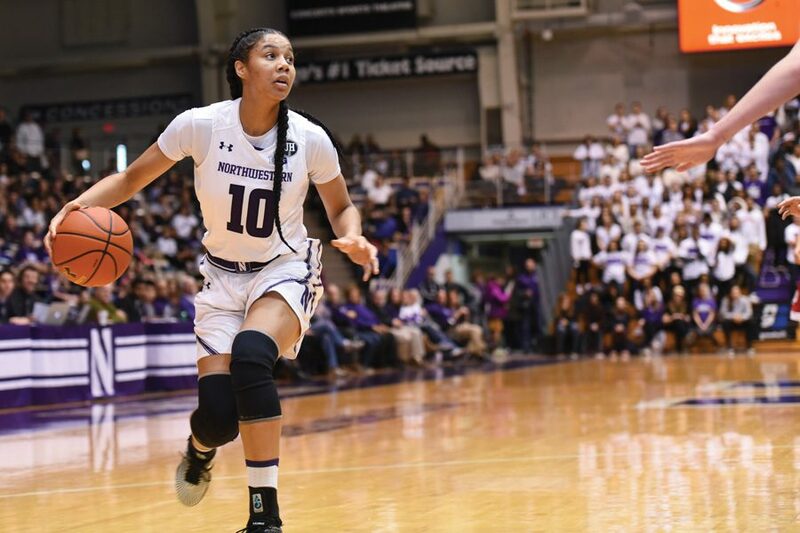 Northwestern’s (17-6, 6-4 Big Ten) leading scorer finished with 28 points and 17 rebounds — despite a 7-for-21 shooting effort — but received little help on the offensive end as the Nittany Lions (15-8, 5-6) ran away with the decisive win. Coffey attributed her offensive success to “just being aggressive” and working hard to draw fouls. She took advantage of various free throw opportunities, shooting 14-for-18 from the line. Though the Cats struggled from the field early, they managed to come out of the first quarter trailing just 17-15. Coffey contributed heavily to NU’s offensive attack, netting 8 consecutive points with four free throws and two field goals. Her offensive effort was especially important in keeping the Cats competitive during the first half when NU not only battled a strong performance from the Nittany Lions, but had to deal with senior guard Ashley Deary’s early foul trouble. Deary was the only other Wildcat to score in double digits, finishing the game with 12 points. The Cats were further hindered by the absence of injured senior guard Christen Inman and a team-wide struggle to score, apparent in its 20-for-59 clip from the field. Though Coffey was silenced from the field in the second quarter, she managed to sink 3-of-6 free throws and kept her team alive with aggressive rebounding, entering halftime responsible for over half of the Cats’ rebounds. After the break, NU’s offensive issues continued, but Coffey managed 6 of the team’s 12 third quarter points, hitting two layups and two free throws. Coffey and the rest of the Cats found a better offensive rhythm in the final period, scoring 18 points, with the senior responsible for half of them. Even though she couldn’t lift her team to a victory, Coffey’s big day bodes well for an NU team that will need her leadership going forward. Coffey hadn’t surpassed 20 points since Jan. 7 and appears to be finding her rhythm just in time, with the Big Ten Tournament less than a month away.